Diameter: 14 mm, Length posted: 168 mm, Length capped: 136 mm. Approximate weight: 47 grams/1.66 ounce. 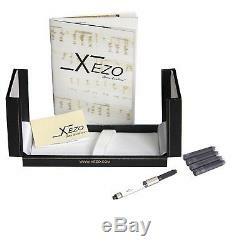 Ink cartridges Interchangeable with many international size refills from xezo, monteverde, visconti, montblanc, waterman. Special offer from Xezo Museum Vault (very limited quantity). The Maestro Series pens were produced in limited editions of 500 pieces per style. We used the finest Natural White Mother-of-Pearl from New Zealand in unique hue variations. Imagine holding in your hands a work of art made of precious, glowing iridescent Natural Mother-of-Pearl and polished to perfection. The special Mother-of-Pearl panels range from white to light blue with red or green overtones. 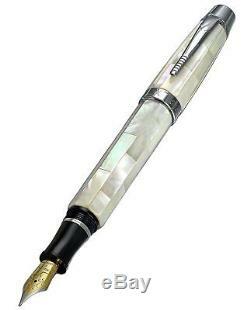 Due to significant color variations of White Mother-of-Pearl no two pens are alike. The edges of the barrel of each pen are hand-finished and smoothly rounded on the outside. Each pen is individually numbered. Due to the hand-crafting process involved in the production of each of our mother-of-pearl pens, the weight of each pen will vary slightly. White Mother-of-Pearl is natural material; therefore, some distinctions in the texture of White Mother-of-Pearl material may occur. These distinctions and variations in texture are not defects, but rather natural attributes which add beauty and uniqueness to each of these handcrafted pens. Pen features MEDIUM point stainless steel nib. 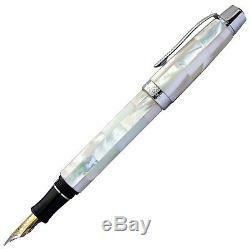 The item "Vintage Xezo Maestro All Natural New Zealand Mother of Pearl Medium Fountain Pen" is in sale since Sunday, May 6, 2018. This item is in the category "Collectibles\Paper\Stationery". The seller is "xezonline" and is located in Sugar Land, Texas. This item can be shipped to North, South, or Latin America, all countries in Europe, all countries in continental Asia, Australia, South africa, New Zealand.